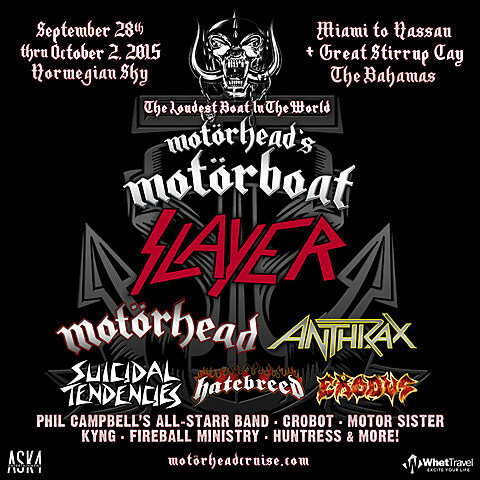 Motörhead‘s floating festival, Motörboat, is back for a second year, setting sail September 28 thru October 2, 2015, from Miami to the private island of Great Stirrup Cay and Nassau in the Bahamas. In addition to Lemmy and crew, this year’s lineup includes Slayer, Anthrax, Suicidal Tendencies, Hatebreed and more. Tickets go on sale March 25. Motörhead’s Motörboat will keep it crazy with theme nights where flying your freak flag is not looked down upon but paraded and appreciated. Weird and wonderful poolside and beach events and activities will keep the motor going, and artist Q&A sessions plus meet & greets will get you up close and personal with your favorite artists on board. All this is punctuated with 24-hour access to the food, bars and fellow Motorboaters who are up all night with music demons to fight. Check out pics from Motörboat 2014 here. Full Motörboat 2015 lineup and flyer are below.